Winter is about here because the flurries were falling this morning in Nashville! The winter cold inspired my painting "A Nice Cold Draft" which I did to participate in the International Equine Artist's Group Winter/Holiday on line show. 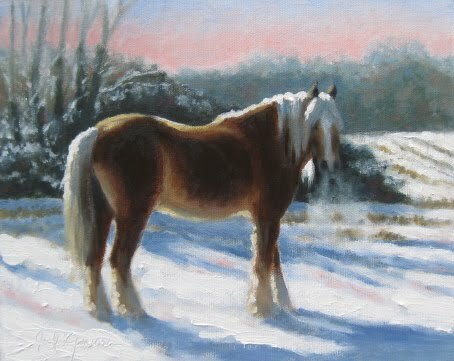 Go to the IEA site ( link is below...) if you would like to relax and scroll through some fun equine paintings inspired by the season. They have an easy people's choice voting system in place, so choose your favorite and cast a vote. Merry Christmas to you all! of wonderful art. This will be my first year participating in the Fine Art in Brentwood Show and I'm excited to be invited. 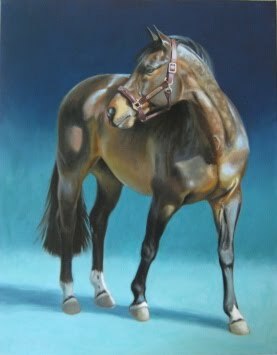 I'll be showing a lot of my equine paintings but also some small gift sized oil paintings that may make that perfect Christmas present. Here is the link to their site so you can get all the information that you need ! Their art issue each year consists of paintings chosen that represent a certain chosen theme. This year is was "making history". I haven't seen the issue yet...but it should be up on their site soon. Also...keep Calvin Borel in your thoughts and prayers as he recovers from a recent nasty fall that resulted in a badly broken jaw. We wish you a quick recovery Calvin! Good news .... My painting, Hartsville Horses has been chosen for inclusion in the 2011 Scottsdale Artist's School "The Best and the Brightest" juried art show and sale. I'll be packing this painting up in a few weeks and sending it to Arizona to hang at the show which runs at the school from January 8 through March 15 2011. 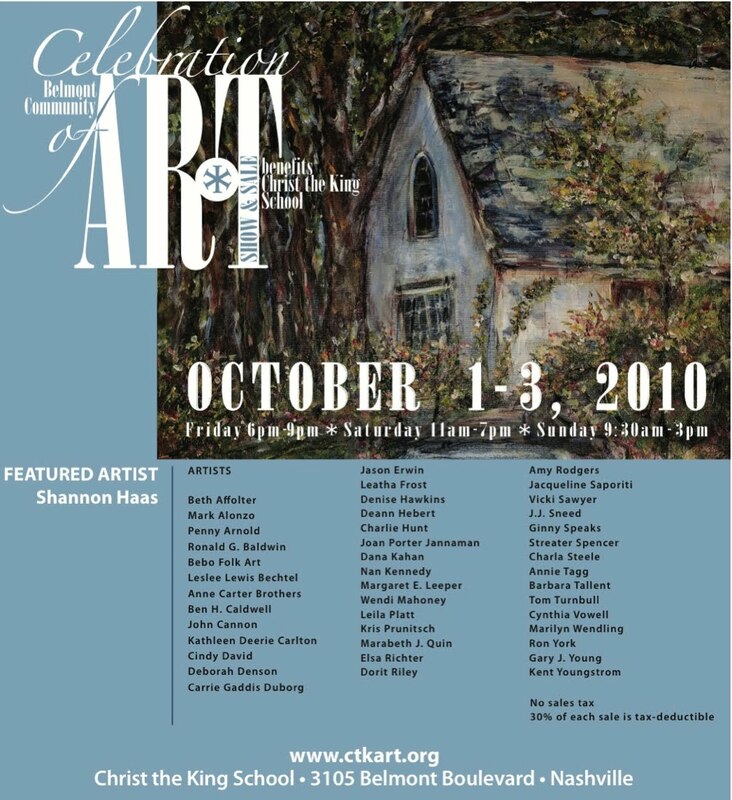 The paintings in this show will also be shown at the Celebration of Fine Art in Scottsdale. 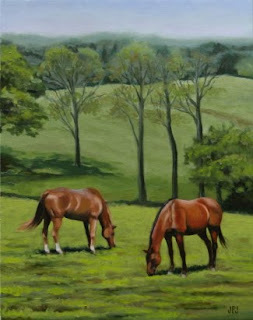 I painted these draft horses at a farm on the road from Gallatin to Hartsville, TN. The back light was irresistible and I just had to paint this one. The horse on the right was the subject of a smaller painting that I did a while back that was on the cover of "The Barn Book" in 2009. That one was so much fun to paint that I just had to do more ....so here they are ..."Hartsville Horses", oil on canvas, 10 x 20. Just a few weeks and the Belmont Community Art Show and Sale will be in full swing. I'm happy to be invited to participate this year. You'll find me including smaller sized works to help fill the need for gift sized paintings since it won't be that long until the holidays are here! See you at Christ the King school between Oct.1st and 3rd! 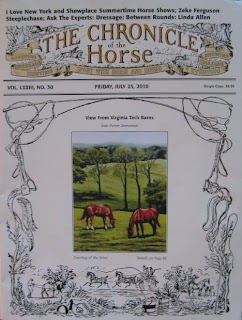 I was thrilled and honored to be chosen for another Chronicle of the Horse Cover for the July 23rd, 2010 issue. The Chronicle has a long list of artists over the years who have graced their magazine covers. Many of those names from the past have been an inspiration for me throughout my life as an artist. was inspiration for this painting. I always smile at the memory of it. I'm always looking for horses wherever we travel. My husband loves Italy and because of him I love it too. My only complaint is that we rarely see horses there in our travels. Granted, the rolling vineyards are breathtaking but the views of grazing horses are few and far between. Last year we spent some time staying at a small coastal resort town called Vieste ( if you see the “spur” of the boot of Italy…that’s Vieste) It has beautiful white cliffs falling into flat sands and calm waters of the Adriatic. We were walking along the base of the cliffs near the town when we heard hoof beats! As a guy was leading his horse down to the beach, his friend pulls up in a small car beside the two of them. This picture is what I snapped as I saw the horse being exercised Italian style….. two guys in a little car, talking and smoking; one with his hand stuck out the window leading the horse at a slow trot with their little dog following behind. I love to see how the Italians sometimes do have a different way of doing things! 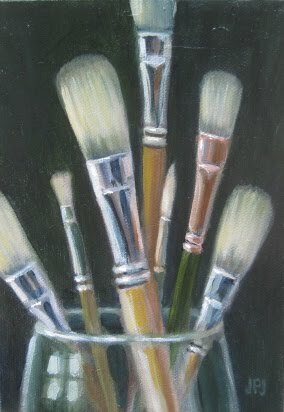 This July I'll be one of the featured artists at PICTURE THIS GALLERY in Hermitage,TN. Here is one of the paintings that I'll be showing there so stop by and check it out if you are in the area. Thursday, July 15th will be the wine tasting and art opening at the gallery. It is located at 4674 Lebanon Pike in Hermitage...Their phone number is 615-889-5640. 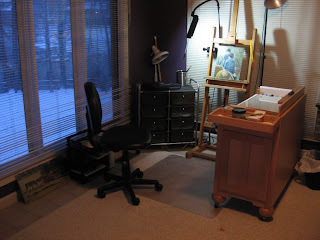 The painting you see here is "Calvin's Race" and is a 12 x 24 oil on canvas. I was inspired by the last day of racing at Churchill Downs in 2009. It was a rainy race day and the mud was a flyin'. That didn't stop Calvin Borel from winning almost every race he rode that day including this one aboard "Lawless Falls". So it goes that he battled for leading jockey with eventual winner Julien Leparoux throughout the 2009 spring/summer Churchill Downs meet. Calvin came in second that day for the season with 61 wins to his rival's 62. Calvin still had his trademark smile on his face after his last race that day and happily gave his goggles to the small group of starstruck little girls waiting with their Dads for a glimpse or autograph after the race! ( He did however, lead in earnings with $3,755,513 to Leparoux's $2,559,363.) In 2010, Mr. Borel was indeed the top jockey for the Churchill Downs season....go Calvin. He continues to make history in the racing world and in my opinion, it couldn't happen to a nicer guy. Shown here is my painting entitled "Sisters", an 11 x 14 Oil on canvas. 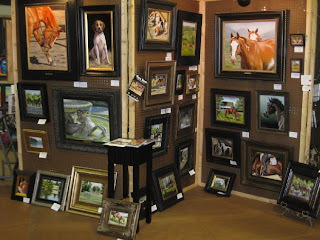 It's headed out to Memphis and Artreach Gallery in Germantown for their "Horse Country" art show. 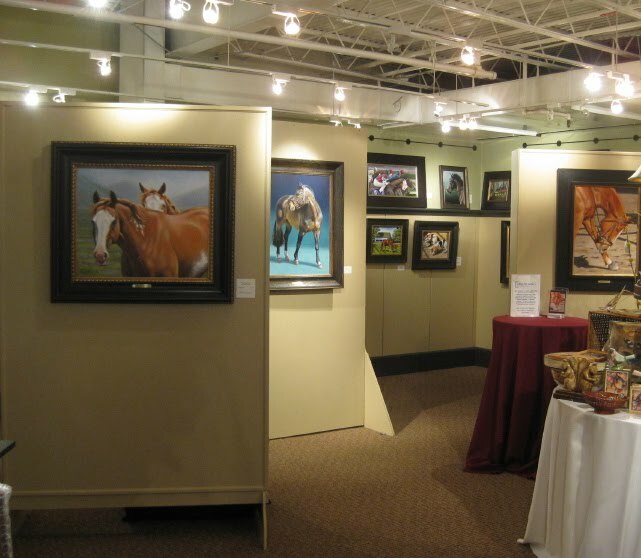 This event coincides with the Germantown Charity Horse Show and celebrates not only equine subjects, but the country landscape as well. "Alias", "Just an Itch", and "Heels Down" will also be making the trip to west Tennessee. The show will be hanging through most of the month of June. Last night was the opening for my Solo Show at Belle Meade Plantation in Nashville. Considering the fact that we are experiencing the devastation of a "1000" year flood....well....some die hard people showed up and it was a very pleasant evening shared with old friends and new! Belle Meade Plantation itself was very lucky to be on high enough ground that it did not suffer terrible damage. Yes, the basement was flooded a bit but I was told that it is a managable problem and they are thankful because it could have been so much worse. The roads surrounding the Plantation left it like an island last weekend. So many are suffering in the area from the aftermath of last week's storm. Nashville is an awesome community and we are coming together to help those of us who really lost so very much. Personally, our home was spared, but many friends homes were not. It is overwhelming..... but it just takes one step at a time..... Nasvhille could really use your prayers for quite a while. Okay....for anyone who might read my blog today....You get a sneak peak ! If you are still planning to come to the show's opening tonight from 5:30-7:30 at Belle Meade Plantation, everything is still OK. Mansion and Visitor center suffered no damage but the main entrance was flooded and damaged, so please follow the directions to the alternate entrance. * Turn left at Belle Meade Blvd. * Turn right at Leake Ave.
* Belle Meade Plantation is on the right. The history of Belle Meade is a rich and important story in the development of the Thoroughbred Industry in the United States. 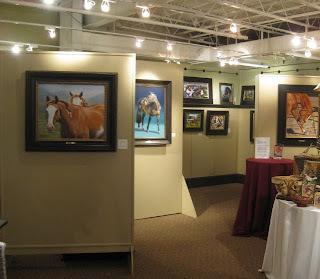 As an Equine artist, that's why I am so happy and honored to have an exhibition here at such an historic place. Here is the link to Belle Meade's "horse history". I have added 7 new works to my collection specifically for this show and I have posted one of them here..... "Alias" 22 x 28 Oil on canvas. If you are in town....I'd love to see you at the opening ! This afternoon my hubby and I went to see the Lipizzaner Stallions at the Bridgestone Arena in Nashville. I think this is my 4th time seeing them and I still get a lump in my throat and teary eyes at sometime during the show, never fail ! I remember my Dad taking me to Philadelphia to see them when I was a teenager so many years ago. It will NOT be the last time I see them either because they are living history. I'll never get tired of watching them. Their beauty is just manifested on so many levels...it's really hard to put into words. We got floor seats for the first time and I am thrilled to have gotten the chance to watch the show from that position. Looking UP at those majestic horses just 6 feet away.... WOW. So, if they come to your town please support their show by attending and cheering them on ...loudly ! This weekend is the annual Art in Bloom Art Show and Sale presented by the Gallatin Junior Service League. This show benefits women's and children's charities of the greater Gallatin, Sumner Co. TN area. I'm bringing along some more small wildlife paintings to add to the horses this year. 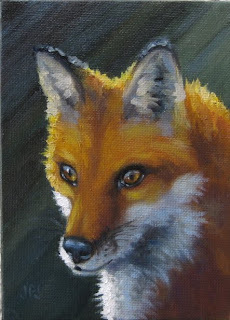 For example, shown here is "Red Fox Backlight" , a 5 x 7 oil on canvas, $160. Our local fox has no idea how many images he has inspired ! I haven't seen him for a while but hope he survived this winter, which for Tennessee , was a cold one. Spring can't be far away......makes me want to paint foals, baby goats,sheep and birds etc ! 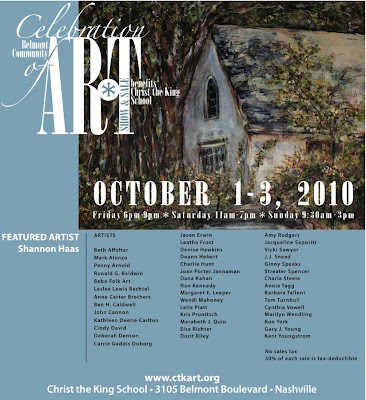 Come on out to the Bluegrass Country Club on Johnny Cash Parkway this weekend on Saturday and see what 40 local artists have to show ! It'll be an eclectic mix of styles..... something for everyone.